San Francisco-born professional golf player and LPGA major title winner, Danielle Kang is the rave of the moment with regards to American women golf. She burst out as a teenager and won back to back US Women’s Amateur titles in 2010 and 2011, becoming only the first woman to achieve such feat in 15 years. In addition to that, she went on to win the KPMG Women’s PGA Championship in 2017. Interesting? Read on to know more about this professional athlete. Danielle Grace Kang is a professional golfer who was born on October 20, 1992. Widely known as “Danielle Kang”, the Ladies Professional Golf Association (LPGA) golfer was born in San Francisco, Northern California but she grew up and was raised in Thousand Oaks, Southern California. Kang was born to her father, K.S. Kang who is late now and her mother, Grace Lee. Kang has an older sibling, a brother named Alex Kang. Alex is also a professional golfer and has played for San Diego State University, California. Golf became a thing of interest to Kang while she was growing up as she watched her brother Alex play. She was initially interested in taekwondo and earned a second-degree black belt at the age of seven. She started playing golf at the age of 12 under the guidance of golf instructor, Scott Schopp. Two years later, in 2007, she qualified for the U.S. Women’s Open Golf Championship. At this point, she said golfing only became a passion for her because her brother always beat her when they played together and she wanted to do all it would take to beat him at the game. She attended a couple of high schools including Oak Park High School and Westlake High School before she went to college at Pepperdine University in Malibu in 2010. Her star sign is Libra and though she is of Asian descent, she was born in the United States and so holds the American nationality while her ethnicity is white. Indeed, since Danielle Kang announced her presence on the world stage as a 14-year old, she has continued to keep herself in the thick of the action anytime women golf is talked about. Her determination and competitive spirit have seen her reach the summit of the sport in a short time as a professional golfer. Kang played golf in college with the school team and then in 2010, she won the U.S. Women’s Amateur the same year by beating Jessica Korda who was considered the favorite to win the Cox Trophy. Kang turned professional after that as she was the only non-pro to participate and make the cut in the LPGA Championship in 2011. Not only did Kang make the cut in the LPGA, she also did for three of the four majors she competed in as an amateur champ. In August 2011, she won the U.S. Women’s Amateur again for a second consecutive time by beating Moriya Jutanugarn, and in the process ending a 15-year record of a consecutive title win as she became the first to do so in 15 years. Her first professional season was not a total disaster as her earnings (over $230,000) ensured that she easily gained full status for 2013. The seasons that followed can be described as average for Danielle Kang and it continued until 2017 which can be said to be her biggest season yet. She produced her most top tens ever in a single season – six – and she also won the KPMG Women PGA Championship at Olympia Fields in the same season (July 2017). She made her highest earnings ($1,005,983) in the same year which saw her finish 17th – a career-best – on the money list. She almost doubled her 2017 titles as she came to a close second in the Sime Darby in Malaysia. Her brother, Alex Kang, also born in San Francisco on June 24, 1990, started playing golf when he was 13 years old in South Korea where their father used to work. He was an inspiration to her while growing up as they always played together. Alex started off as a soccer player in his school in Brazil and played as a forward but he started looking for another sport to fit into when he realized he wasn’t good enough for soccer. 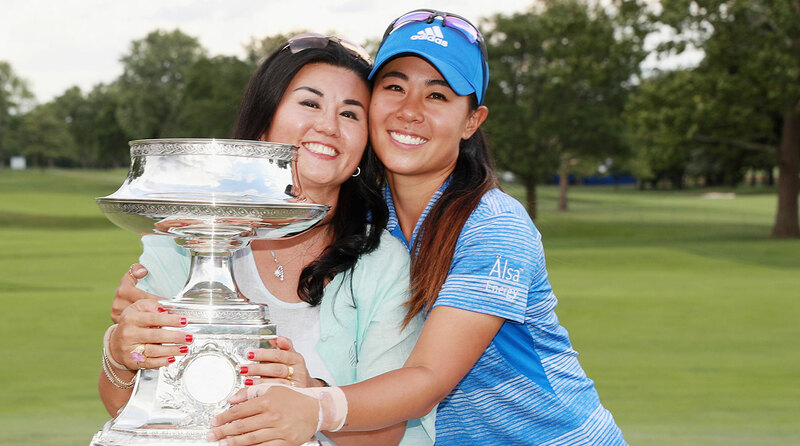 Kang says she relies on her brother as her friend and ally which is no wonder he became her caddie after her father passed on – stepping into the fatherly role for her. Danielle Kang is not yet married at the moment and is focused on her professional golfing career. There is no husband or children rumored to be hers and she is not attached to anybody with regards to a romantic relationship. Her best friend according to her is her elder brother, Alex Kang who she easily confides in as they share the same professional careers.